Originally commissioned in 1989, with just 1 owner from new - Studio 150 Amsterdam. Situated on the Polygram premises Studio 150 was widely regarded as Holland's best-equipped, and hosted Mick Jagger, Paul Weller and Def Leopard. Weller's 'Studio 150' album reached No2 and Def Leopard's 'Adrenalize' No1 UK and USA respectively. Although the console was meticulously maintained, it has undergone a stringent refurbishment prior to commissioning at Summerfield Studios by Mark Derksen who is well known in the business as one of the best in his field for renovating A Class consoles to exceed original specifications. SSL 4040 G series console in E colour, (as ordered by the first owner). 40 channel frame - 40 G series channels loaded - balanced buss - G 292 pink G series EQ - Left hand on board patch - Metering is VU - NTP peak meter in centre - VCA faders with 8 VCA groups faders - no computer. The refurbishment program included; tooth brush clean - full recap - fader service/re-lubricated - switch boards sonically cleaned - switches replaced where needed - cosmetics redone with original SSL leather - respray of panels - airflow upgrade to reduce heat buildup - lamps/bulbs to LED upgrade of all switches - VU back light to backlight LED upgrade - fully refurbished to exceed factory specifications. 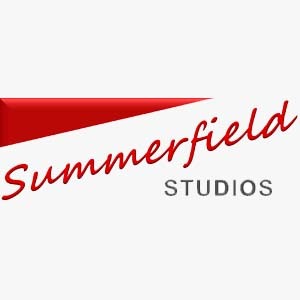 The console was commissioned at Summerfield Studios by Derksen himself in August 2016. Summerfield Studios also offers customized mix control at your fingertips with Aviom personal mixing systems. Every musician has the freedom to adjust their monitor or cue mix whenever they want—without affecting anyone else and without depending on an engineer. Want more lead vocal? Less bass? Need to adjust the stereo imaging of the guitars? With an Aviom Personal Mixer, it's all just a touch away. Aviom personal mixers are designed with the performing and recording musician in mind, so there are no menus to navigate, no soft keys, and no complex programming. Centre stage of the live room sits a pristine Yamaha C3 owned previously from new in 1983 by renown composer Alan Parker, and featured on many hit scores from TV & film. It has sat in his private Surrey studio since delivery and is in remarkable condition. The recordings for his compositions would start at his private studio and larger orchestral parts added later. This Vintage C3 is one of the best examples in the UK, and it looks and sounds absolutely beautiful. TV - Rhodes - Minder - Van der Valk - Walking with Cavemen - Victoria and Albert - Nancherrow - Winter Solstice - Coast - The Cry - Marion Again - Fallen Angel, plus several others. Rather grand, I'm sure you'll agree.